BIOS marine technician Nick Matthews signals to fellow crew members while securing researcher Neal Pettigrew’s wayward buoy on board the BIOS-operated research vessel Atlantic Explorer after its recovery just before Halloween. Pettigrew, in blue hat, waited nearly four years for the buoy’s return. Video by Nick Mathews. 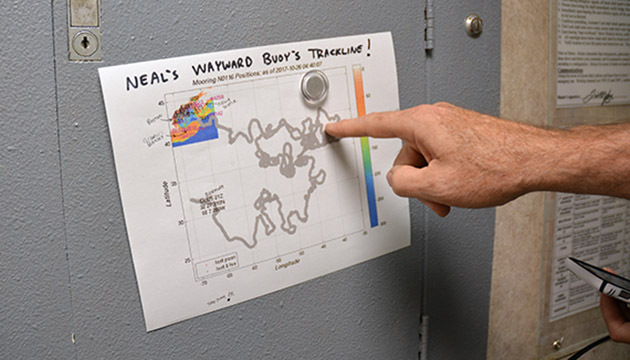 Oceanographer Neal Pettigrew is still piecing together the 1,392-day trip his runaway buoy made from the Gulf of Maine, which ended with its recovery on board the BIOS-operated research vessel Atlantic Explorer just before Halloween. But this much he knows: just by drifting freely over huge distances around the Atlantic, the buoy collected a remarkable amount of information about the ocean. A map of the Atlantic Ocean posted outside the mess deck on the Atlantic Explorer titled “Neal’s Wayward Buoy’s Trackline” showed the 22,000-mile (35,0000-kilometer) trail the buoy made (nearly the equivalent distance around Earth at the equator). In the first months, after snapping free from its anchor in the Gulf of Maine, it moved about 600 miles (about 1,000 kilometers) north of the Azores, went west of Portugal, then traveled southeast of Bermuda, halfway to Turks and Caicos. A map of the Atlantic Ocean posted outside the mess deck on the Atlantic Explorer showed the 22,000-mile (35,0000-kilometer) trail the buoy made in the Atlantic. That’s nearly the equivalent distance around Earth at the equator. It floated at the whim of wind, waves, currents, and storms, drifting in one small area of the Atlantic for weeks, then rode for months in loops around the Gulf Stream. As it randomly drifted, trailing its wire rope mooring line with attached sensors, it continued to send daily information via satellite to Pettigrew’s computer. The trouble was recovering the 12-foot-tall, nearly one-ton instrument, known as “Buoy N.” Though Pettigrew tried repeatedly through the years, he said, “ships weren’t readily available, the money wasn’t there, or the weather wasn’t right.” Even as some battery-powered instruments died, those powered by the buoy’s six solar panels kept running. Buoy N, where are you? Pettigrew, a physical oceanographer at the University of Maine in Orono, and his team of researchers, designed and built Buoy N in 2004. 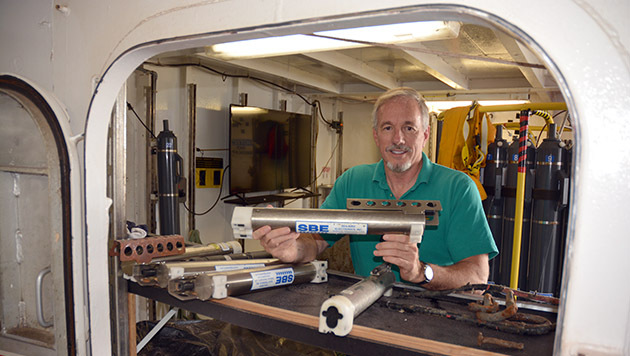 It was one of about a dozen ocean research platforms he’s used for research in the Gulf of Maine since beginning his observations of coastal ocean circulation in 1997. The real-time weather data collected by the buoys are made accessible for use by mariners, from fishermen to recreational kayakers. In addition, data from the buoys are used to teach university students about water circulation and develop ecosystem models. The buoy's instruments are powered by solar panels and measure air temperature, wind strength and direction, and wave height. Other sensors capture data on water temperature and conductivity (to measure salinity) down to 590 feet (180 meters), and levels of chlorophyll, which help determine the amount of phytoplankton in the water. For identification, Pettigrew gives each new buoy a single letter name. Buoy N had been used for 14 years, including its last placement 172 miles (about 280 kilometers) from the Maine coast in the northeast channel of the Gulf of Maine. This area is known for its high nutrient inflow that leads to rich phytoplankton and zooplankton populations, as well as excellent fisheries from nearby George’s Bank. Then on January 2, 2014, a winter storm hit. Out of custom and concern, Pettigrew's research group monitored their computers while their fleet of seven buoys sent hourly signals via satellite from their sentinels at sea, reassuring them that the pounding wind, high waves, and strong currents had not altered the buoys’ positions. But by evening, they could see that Buoy N was on the move—and traveling fast out to the North Atlantic. With the storm raging and no ship available, Pettigrew could only watch as the signals showed it drifting away. After months of monitoring the buoy, many of Pettigrew’s colleagues started to give up on a recovery. Pettigrew's research group visited the location where Buoy N tore free of its mooring and replaced it with a twin buoy. After returning to BIOS, Neal Pettigrew removed data-wielding instruments from the buoy that he brought back to the University of Maine in October. By the end of the first year, Pettigrew said he went from checking the status of the buoy’s location online from multiple times a day to multiple times a month. Several times over the years he could see it was a few hundred miles from research ships that could recover it. He reached out to colleagues at oceanographic institutions asking if they would retrieve the buoy. Each time, foul weather, high seas, or a higher priority need by scientists on the recovering ship would scrub their effort. In September, Pettigrew checked on the status of the buoy. When he noticed it drifting closer to Bermuda, he contacted BIOS to request a pick up by the Atlantic Explorer. High seas and the priorities of other scientists using the vessel caused initial delays, but his patience paid off. Pettigrew flew to Bermuda, and on October 24 stood on the vessel, saw his buoy, and—with the help of crewmembers—hooked the buoy with the ship’s A-frame to raise it to the deck. Mussels clung to various instruments underneath the buoy, metal bolts and chains rusted from saltwater corrosion, and years of sun exposure caused the trademark bright yellow paint to fade. 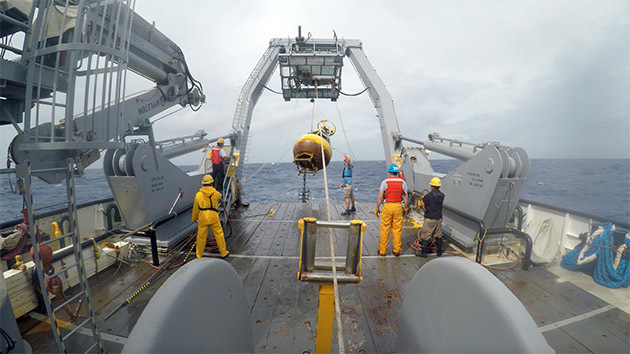 Remarkably, though, the majority of instruments remained in place, including the Acoustic Doppler Current Profiler (ADCP) that made current measurements down to depths of 524 feet (160 meters). Antennae and instruments used to measure wind speed still bristled from the top. At dusk the first night the buoy was on deck, Pettigrew noticed that a small, amber light on top of the buoy that blinks to alert passing ships of its presence still flashed a signal every 15 seconds. Crew members from the Atlantic Explorer helped University of Maine physical oceanographer Neal Pettigrew (in green shirt) recover his roving buoy, which went missing nearly four years ago. They made the recovery on October 24, then returned to BIOS with the nearly one-ton buoy. Two days after recovering the buoy, the ship returned to BIOS, where Pettigrew stripped the sensors from the buoy for return with him to the University of Maine. He downloaded data records from the ADCP that were not all sent via the satellite system, but still needs to download the data logger to recover available data, including measurements of wind, atmospheric pressure, and waves. In addition, he will download the complete data records from temperature and salinity sensors. 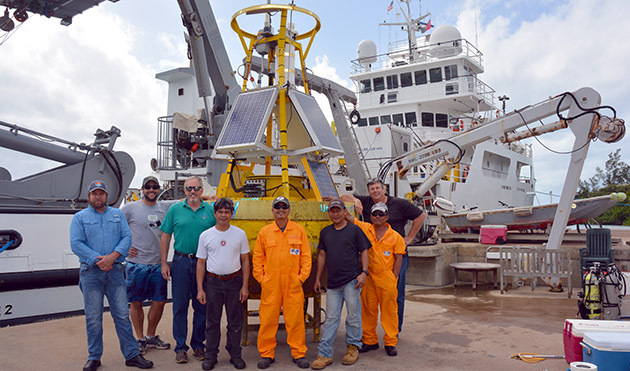 The buoy will remain in Bermuda until next year, when the Atlantic Explorer will drop it at a port in New England during travels to the University of Rhode Island for research. Pettigrew expects to replace corroded pieces, make some design improvements, and return Buoy N to sea—this time, perhaps free and deliberately without an agenda, just to see what happens.